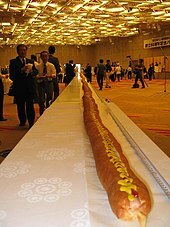 The hot dog   or dog (also spelled hotdog) is a grilled or steamed link-sausage sandwich where the sausage is served in the slit of a partially sliced hot dog bun, a bun of size and shape to hold the sausage. It can also refer to the sausage (the wurst or wörst) of its composition itself. The sausage used is the wiener ( Vienna sausage) or frankfurter (also frank). The names of these sausages also commonly refer to their assembled sandwiches. Typical condiments include mustard, ketchup, mayonnaise, and relish, and common garnishes include onions, sauerkraut, chili, cheese, coleslaw, and olives. Hot dog variants include the corn dog and pigs in a blanket. The hot dog's cultural traditions include the Nathan's Hot Dog Eating Contest and the Oscar Mayer Wienermobile. The word "frankfurter" comes from Frankfurt, Germany, where pork sausages similar to hot dogs originated. 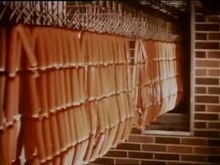 These sausages, Frankfurter Würstchen, were known since the 13th century and given to the people on the event of imperial coronations, starting with the coronation of Maximilian II, Holy Roman Emperor as King. "Wiener" refers to Vienna, Austria, whose German name is "Wien", home to a sausage made of a mixture of pork and beef. Johann Georg Lahner, an 18th/19th century butcher from the Franconian city of Coburg, is said to have brought the Frankfurter Würstchen to Vienna, where he added beef to the mixture and simply called it Frankfurter. Nowadays, in German-speaking countries, except Austria, hot dog sausages are called Wiener or Wiener Würstchen (Würstchen means "little sausage"), in differentiation to the original pork-only mixture from Frankfurt. In Swiss German, it is called Wienerli, while in Austria the terms Frankfurter or Frankfurter Würstel are used. 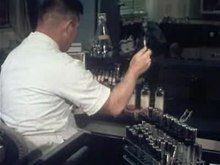 The first skinless hot dog casings were produced by Freund's new company under the name " Nojax", short for "no jackets" and sold to local Chicago sausage makers. A hot dog sausage is prepared and served in various ways. It is reheated for safety by any means (boiled, grilled, fried, steamed, broiled, baked, microwaved, toasted, etc). 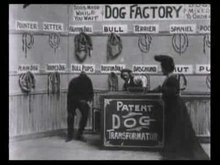 Typically it is served in a hot-dog bun with prepared mustard and optional other condiments. The sausage itself may be sliced and added, without bread, to other dishes. Hot dog stands and trucks sell hot dogs at street and highway locations. Wandering hot dog vendors sell their product in baseball parks. At convenience stores, hot dogs are kept heated on rotating grills. 7-Eleven sells the most grilled hot dogs in North America — 100 million annually. Hot dogs are also common on restaurants' children's menus. Many variations are named after regions other than the one in which they are popular. Meaty Michigan hot dogs are popular in upstate New York (as are white hots), while beefy Coney Island hot dogs are popular in Michigan. Hot wieners, or weenies, are a staple in Rhode Island where they are sold at restaurants with the misleading name "New York System." Texas hot dogs are spicy variants found in upstate New York and Pennsylvania (and as "all the way dogs" in New Jersey), but not Texas. Some baseball parks have signature hot dogs, such as Dodger Dogs at Dodger Stadium in Los Angeles, and Fenway Franks at Fenway Park in Boston, which are boiled then grilled,[ citation needed] and served on a New England-style bun. Skinner's Restaurant, in Lockport, Manitoba is reputed to be Canada's oldest hot dog outlet in continuous operation, founded in 1929, by Jim Skinner Sr.   Hotdogs served at Skinners are European style footlongs with natural casings, manufactured by Winnipeg Old Country Sausage in Winnipeg, Manitoba. ^ a b Popik 2004:" Hot Dog (Polo Grounds myth & original monograph)"
^ Harris, Carole Stallings; Baker, Susan P.; Smith, Gary A.; Harris, Richard M. (May 1984). "Childhood Asphyxiation by Food: A National Analysis and Overview". JAMA. 251 (17): 2231–2235. doi: 10.1001/jama.251.17.2231. PMID 6708272. Retrieved 6 March 2012.